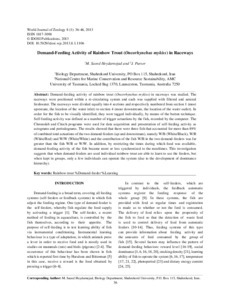 Demand-feeding activity of rainbow trout (Oncorhynchus mykiss) in raceways was studied. The raceways were positioned within a re-circulating system and each was supplied with filtered and aerated freshwater. The raceways were divided equally into 4 sections and respectively numbered from section 1 (most upstream, the location of the water inlet) to section 4 (most downstream, the location of the water outlet). In order for the fish to be visually identified, they were tagged individually, by means of the button technique. Self-feeding activity was defined as a number of trigger actuations by the fish, recorded by the computer. The Chronolab and Citech programs were used for data acquisition and presentation of self-feeding activity as actograms and periodograms. The results showed that there were three fish that accounted for more than 89% of combined total actuations of the two demand-feeders (up-and downstream), namely W/B (White/Black), W/R (White/Red) and W/W (White/White) and the contribution of the fish W/B in the two demand-feeders was far greater than the fish W/R or W/W. In addition, by restricting the times during which food was available, demand-feeding activity of the fish became more or less synchronized to the mealtimes. This investigation suggests that when demand-feeders are used individual rainbow trout are able to learn to use the feeders, but when kept in groups, only a few individuals can operate the system (due to the development of dominance hierarchy).